Pasta is a must in our house. Sometimes during the summer, I’m perfectly content with a bowl of buttered noodles with Parmesan cheese. When it’s a million degrees outside, the last thing I want to do is spend more than 10 minutes in the kitchen with the oven and stove on. I just want to come home and sit on the couch with my AC at full blast. 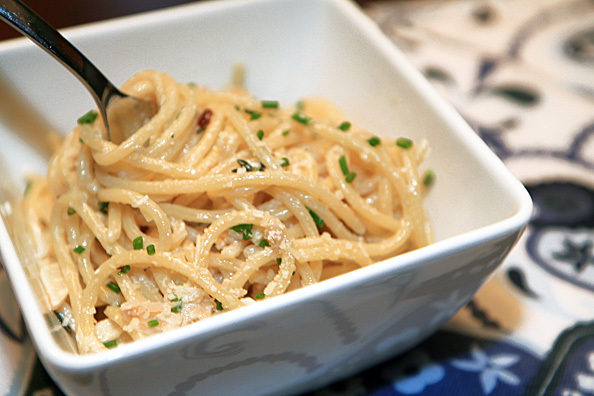 Lemon Cream Spaghetti is my “dressed up” version of noodle night. It’s kind of my play on a Fettuccine Alfredo classic – without the expensive cheese and you don’t have to wait hours for a sauce. I brighten up this dish with a little lemon and add in some red pepper flakes – just for a little kick. This recipe is like Chinese food, it’s even good cold. Bring a large pot of water to a boil. Liberally season the water with salt and add the spaghetti into the pot. Heat olive oil in a large, deep skillet over low heat. Add garlic and crushed red pepper flakes. After the pasta has cooked for 10 minutes, add about 1/3 cup of the cooking water from the pasta to the garlic and oil. Stir to combine and add lemon juice and cream. Raise heat a bit to bring sauce to a bubble. Drain pasta when it is al dente. Add lemon zest and half of the cheese to the cream sauce. Season the sauce with salt and pepper. Be sure to go light on the salt though, because the cheese is salty. Add pasta back to the pot and turn off heat. Toss the pasta with sauce a minute or 2, allowing it time to soak up the sauce. Finish the pasta with the remaining cheese and chives. Pour into a serving bowl and enjoy.